The Interactive Learning Technology Laboratory of the State University of New York at Oswego has developed a Tablet PC-based, ink-input enabled learning utility that will aid students in learning the UML syntax as well as teachers in critiquing UML diagrams designed by students. This is intended to enhance the learning and teaching experience regarding UML using non-traditional interfaces. As a merely ink-based application, SketchUML is a novel approach in penbased user interfaces. As such, the usability of it has not been assessed. This study addresses the question of usability of non-hybrid, ink-only, non-traditional interfaces by conducting usability tests. The collected data shows that ink-only interfaces facilitate learning in non-expert users and do not hinder the usability and learnability of these interfaces and allow for an enhanced learning experience. Made available in DSpace on 2008-10-24T20:16:09Z (GMT). B. Tenbergen, C. Grieshaber, L. Lazzaro, & R. Buck 44 UML softwares that are currently available do not tackle this problem. They are not designed to facilitate the learning experience of a user to learn the syntax of UML. Instead, these programs are designed to inco rporate more and more features, which results in amazingly complex software that is hard to use for novices. This problem is tackled by SketchUML. Previous publications by Qiu (2007) have shown that this software is a very usable and versatile tool for learning and designing UML diagrams. The product has been mass ively augmented since Qiu (2007) and incorporates many new features. SketchUML is a completely user centered software. It is designed to facilitate the learning of computer-aided UML design, so that it is virtually entirely naturalistic. The interf ace is designed with simplicity being the driving force, offering only a paper-like white canvas and a menu bar. Users can simply open the application and start drawing UML diagrams, as if they would use pen and paper. Designed for Tablet PCs, SketchUML acc epts input using the Tablet PC's pen or stylus and converts the drawn ink into UML components, if the ink input corresponds to a valid symbol in UML. This allows for immediate feedback to the user when an ink gesture is not valid UML syntax component. The user is thereby forced to design UML diagrams accurately which aids in learning the UML syntax. Since SketchUML is designed to be as versatile as possible, it allo ws to fully edit the entire diagram at any point in the design process, just as users would expect to use pen and paper. Also, SketchUML is designed to be robust against different drawing styles of ink gestures that represent a UML symbol for instance, it does not matter if a user draws a square by drawing one side at a time, lifting the pen tip every time a stroke has been performed, or if the user draws a square by using only one stroke from start to end, with the start and end point being identical. Previous studies have shown that using Ta blet PC technology is an effective tool for teaching and collaborative learning (Bull et. al., 2004; Berque et. al., 2004; Simon et al., 2004). SketchUML is intended to allow for an augmented teaching experience for faculty teaching UML to students. This is achieved by the ability to import a student's diagram that has previously been saved to hard disk, and critiquing it using the Teacher Mode. Critiquing the students' diagrams allows the teachers to give feedback on the student's work online, without the need of paper. Also, this reduces the amount of time needed to correct students' solutions to a given assignment. More significantly, it aids the teacher in a way that there is no need for an actual teacher's model solution. It is conceivable that the system can create a model solution or a solution template by analyzing a number of student solutions that have been critiqued by the teacher. Overall speaking, SketchUML offers a good learning platform for students and teachers with regard to UML diagram design and syntax learning. Its wide variety of user centered features and the incorporat ed design metaphors create a well developed conceptual model that allows users to learn the syntax of UML rather than learning the software that is supposed to aid them to do so first. This paper discusses the research that has been done to augment the usability of SketchUML. A number of usability tests have been conducted in order to assess the pitfalls of ink-only, non-traditional interfaces and to understand how these types of interfaces can aid in e-Learning. The results of these experiments directly infl uenced the understanding of how learners interact with learning software and how the proposed software SketchUML needs to be augmented in order to provide for a decreas ed learning curve and a more naturalistic approach in Advanced Learning Technologies. B. Tenbergen, C. Grieshaber, L. Lazzaro, & R. Buck 52 the last gesture was that the system recogni zed. Alternatively, tool tips that appear on the screen when the cursor is hovering over a symbol and explain what the underlying symbol represents can help to disambiguate the meaning of similar symbols. For the near future, further development is planne d to add more UML-related features (i.e. symbols of the UML syntax that are curren tly not supported in SketchUML) as well as non-UML-related features, like undo/redo f unctionality, or a layout algorithm that supports the user to design uncluttered diagrams. V. Acknowledgement This project is made possible by the generous support of Dr. Gary Klatsky, Dr. Douglas Lea (both at SUNY Oswego) and Dr. Lin Qiu (formerly at SUNY Oswego) and, in part, The Research Foundation of SUNY throug h the generous funding of the HewlettPackard Development Company, L. P., HP Technology for Teaching Grant Number U06TFH0037C. VI. References Berque, D., Bonebright, T., and Whitesell, M. (2004). Using pen-based computers across the computer science curriculum. Proceedings of the 35th SIGCSE Technical Symposium on Computer Science Education. Norfolk, Virginia, USA, pp. 61-65. Bull, S., Bridgefoot, L., Corlett, D., Kiddie, P., Marianczak, T., Mistry C., Sandle, N., Sharples, M., Williams, D. (2004). Interacitive Lagbook: the development of an application to enhance and facilitate co llaborative working within groups in higher education. A book of papers from MLEARN 2004. pp. 39-43. Fowler, M. (2003). UML Distilled, Third Edition: A Brief Guide to the Standard Object Modeling Language. Addison-Wesley, Pearson Education. Heines, J. M., Liang, W. T. (2007). Combining, Storing, and Sharing Digital Ink. Proceedings of SIGCSE 2007. Covington, Kentucky, USA. Qiu, L. (2007). SketchUML: The Design of a Sketch-based Tool for UML Class Diagrams. 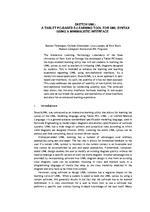 Proceedings of World Conference on Educational Multimedia, Hypermedia and Telecommunications. Chesapeake, Virginia, USA, pp. 986994. Simon, B., Anderson, R., Hoyer, C., and Su, J. (2004). Preliminary experiences with a tablet PC based system to support active learning in computer science courses. SIGCSE Bull. Vol. 36, No. 3, pp. 213-217.